While most smartphone manufacturers have embraced the concept of wireless charging, Apple is yet to invest fully into this technology. Still, there are various ways you can power your iPhone 7 phone wirelessly and in the safest way possible. Readgo is a nice looking and sturdy wireless charger that provides easy charging solution for users, it has the capacity to charge your smartphone seamlessly at top speed. It’s been designed to start charging immediately after you place the iPhone 7 on the pad, and a light will flicker to alert you that charging is underway. The in-built Smart Breathing LED light indicator becomes active when a smartphone is charging, plus the mild breathing light won’t cause any unnecessary distraction to the user even at night. Furthermore, unlike other devices that often overheat when a phone is placed on top, Readgo has been built with quality material that doesn’t become hot when charging a smartphone. 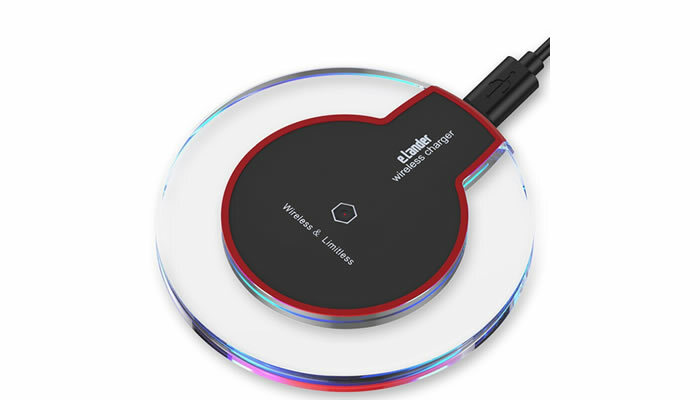 The Wireless Charger delivers up to 5V/2A input and 5V/1A output thus charging your phone in high efficiency. During use, your device shall always be guarded against high voltage, overcharge or short circuit. With its combo unit of Wireless Charger Receiver and Qi Wireless Charger, Readgo has been named by users as The Most Practical Combination Set and The Most Favorable Choice. Additionally, it comes with an extra 2-in-1 USB charger cable that allows for easy sync and charging at fast speeds. The charging receiver is well-designed and you can actually bend and store it inside the case for safekeeping. Whenever you feel like connecting to a cable, simply un-plug the receiver without taking the smartphone out of its case. The charging pad is also very reliable and won’t discontinue charging after every second like some other models often do. Furthermore, Readgo has various accessories that are sold together with it and are of top-notch quality. BEZALEL Futura is endowed with some of the most advanced technologies in wireless charging, it’s very effective in providing safe charging solutions. BEZALEL has been designed to be compliant with the latest WPC virtual charging standards. It typically arrives from the manufacturers in a simple, straightforward and easy to open package. The charger is elegant, sleek looking and lightweight as well as portable. The company logo is beautifully placed on top thus making it easy to pass as an expensive product, despite its affordable price. BEZALEL’s cover plate is made from a solid crystal clear plastic material that closely resembles delicate glass but wouldn’t break. The center ring has a rubberized bottom and top surface that prevents your charger or iPhone 7 from slipping, it also comes with a 3ft USB cable accessory though is still compatible with other shorter mini-USB cables you may have. Though the unit doesn’t have a wall plug, users can still acquire one affordably if they want to. Once plugged, the charger emits a nice blue light that steadily pulsates into a dim upon detection of a smartphone being charged. BEZALEL has quick response system and can detect a phone to start charging even with the hard case still on. In summary, the wireless charger is reliable and with a sleek design that takes up very minimal desktop space. It’s also easy to carry. Upow is different from other chargers because of its unique ultra-thin design, its advanced energy management system doesn’t just help in providing maximum output but also consumes less power. Additionally, there’s a LED indicator that shows the actual status of your charging. Plus the silicone anti-slim mat helps in keeping your iPhone 7 in position while charging. For those who want to carry it around, there’s no need to worry as the charging pad can easily slip into your pocket. Since Upow has a powerful Qi-compatible receiver, it starts charging immediately you put down the iPhone7. There are no cables or USB interface system required. Moreover, Smart IC allows for high-efficiency energy management function that increases output and reduces energy consumption when in idle mode, with LED charging status also on display.